By Michał Szczuryk vel Szczerba - PhD candidate and Kacper Pawlik. Why is it important to choose the optimal size of the intubation tube? 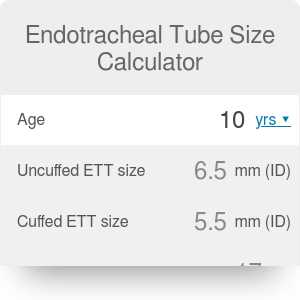 With our endotracheal tube size calculator you can now choose an optimal intubation tube for your patients. Doesn’t matter whether they are adults or children. We have got you covered for all of them! In the text below you will learn what ET tube is and how to perform a correct endotracheal intubation. After reading, you will also know what methods are used to check if the ending of the endotracheal tube is in the right place. Finally, you will get familiar with the ET tube size formula that we are using in our endotracheal tube size calculator. For more intensive pediatric care, check out our pediatric blood volume calculator. Endotracheal intubation is a medical procedure in which a doctor, normally an anesthesiologist, inserts a special plastic tube - endotracheal tube, into the airways of a patient. Thanks to that, he achieves two major goals. Firstly, he assures that all of the air pumped during ventilation (e.g., with an ambu-bag) goes directly into the lungs of the patient. In comparison, when ventilating through a mask that we put on the patient’s face, there is a huge air leak. The air escapes through gaps between the mask and the patient’s face or goes through the throat into the patient’s stomach. Secondly, he completely seals the airways. The only way for the air to get inside is through the insides of the ET tube. This is prevention against asphyxiation - a situation in which contents of the stomach go back through the esophagus (basically vomiting) and get sucked into the respiratory tracks of the patient. The patient can also asphyxiate with blood (e.g., from a nose bleeding) and other substances that get into his mouth, nose, and throat. The endotracheal intubation is also performed before surgical procedures requiring general anesthesia. Thanks to that, an anesthesiologist can precisely control the quality of ventilation throughout the operation and administer drugs in gas form in correct dosage (check out our article on pediatric dose of paracetamol). Get all the necessary equipment: gloves, laryngoscope (a device used to make the entry to the larynx visible for a person performing intubation), ET tube of the corresponding size (acquired thanks to our calculator! ), syringe used to inflate a cuff of the endotracheal tube (if it has one). Make sure that the patient is correctly sedated. Stand behind the patient’s head. Open his or her mouth and move the tongue to the left with the laryngoscope. Insert the laryngoscope further into the patient’s mouth and try to make the entry to the patient’s larynx visible (between his or her vocal cords). Try to place the end of ET tube inside the patient’s larynx. If successful, inflate the cuff sealing the airways and preventing asphyxiation. Place your stethoscope on patient’s stomach and check if you can hear bubbling-like noises. It means that air goes into the patient’s abdomen and you need to intubate once more. Place you stethoscope on both sides of patient’s chest. You should hear a symmetrical sound of air going through bronchi and fulfilling lungs. Use a capnograph, a device checking if patient exhales with air containing carbon dioxide. The exhaled air should have a higher level of carbon dioxide because it received it from blood flowing around alveoli inside the patient’s lungs. If still in doubt, perform a radiological test, e.g., a chest X-ray. It is often needed to intubate pre-term babies on the maternity ward as they have difficulties with breathing by themselves. Each case should be individually assessed. Check out our APGAR score calculator to find out more about assessing the infant's condition. Insertion of an oversized tube may lead to a sore throat and bleeding gums. Keeping a too big ET tube inside patient’s larynx for a more extended period can have more severe consequences: damage to the vocal folds, resulting in a change of one’s voice and hoarseness, or a laryngospasm (potentially life-threatening contraction of vocal folds). Laryngospasm is dangerous especially after removing the ET tube because it is the only thing preventing total contraction of larynx and suffocation of the patient. Undersized intubation tube will be ineffective in ventilating the lungs, because of air leaking around it and going e.g. to the patient's stomach. Too small endotracheal tubes also tend to slip out of the airway. It can give us a symptom of a sudden decrease in patient’s saturation (hemoglobin oxygenation level), and we will not be able to hear the sound of air flowing inside the patient’s lungs. 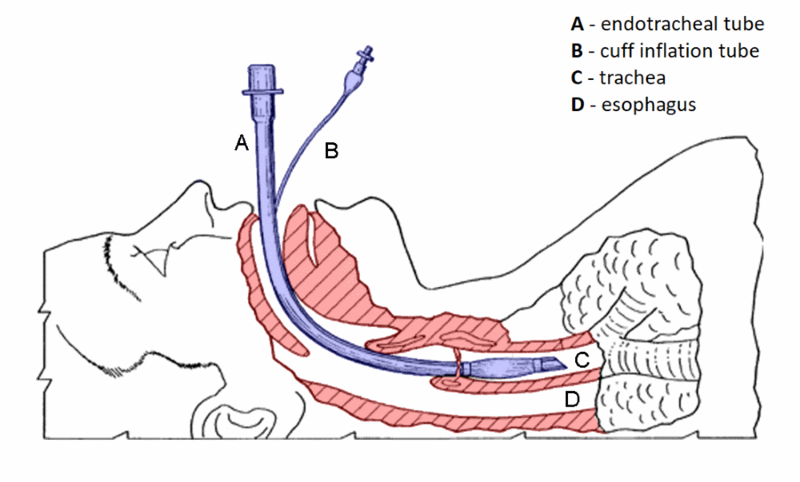 The endotracheal tube (ETT) may be equipped with an inflatable plastic balloon (cuffed ETT) which, when inflated, stabilizes the device in place. Additionally, it seals the airway and protects them from an unwanted material (e.g. stomach contents, blood, saliva) getting inside. Cuffed ET tubes can be safely used in most ages, except newborn infants (<3 kg), and are preferred by the hospital workers. For an easier insertion, a stylet can be used to stiffen the tube and mold it to a desirable shape. The result is the tube's internal diameter in millimeters (mm ID). The cuffed ET tube has to be smaller in diameter (typically by 0.5-1mm) than the respective uncuffed tube, to account for the size after cuff pressurization. Unfortunately, when we're older physical development slows down. Because of that, it is easier to predict endotracheal tube size from height and weight, not age alone. This is why - all too often - the ET tube is chosen by trial and error. However, there are more and more ways of estimating the correct size. Different cases call for different ways to estimate the tube size. An overweight, short boy will require a differently sized ET tube than a slim, tall girl of the same age. A more complex and flexible ET tube size formula for pediatric patients is the Eck's formula - taking into account age, height and weight. There are many examples of such equations construed for individual variables. For example, evidence shows that body length is a much better correlate for ETT size than age. For this reason, the Broselow tape allows us to rapidly estimate the equipment size and drug dosages based on the height. The same approach is represented by this example. These simple formulas will help every adept of emergency medicine and anesthesiology to be knowledgeable when it shows and and effective when it counts. Michał Szczuryk vel Szczerba - PhD candidate and Kacper Pawlik. Endotracheal Tube Size Calculator can be embedded on your website to enrich the content you wrote and make it easier for your visitors to understand your message.